PJ designs Sets, Costumes & Projection content, and holds a 1st class (Hons) degree in Professional Production Skills from Guildford School of Acting. 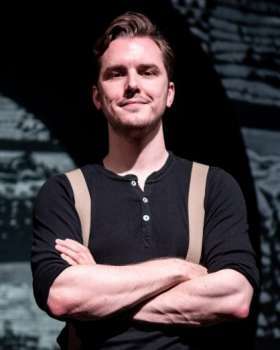 Credits include: All In A Row (Southwark Playhouse); Fanatical (Playground Theatre); A Little Princess (Royal Festival Hall); One Minute, The Secret Garden (Barn Theatre); Doubt, A Parable (Southwark Playhouse); Outlaws To In-Laws (King’s Head); Legally Blonde (Alexandra Theatre); The Dover Road (Jermyn Street Theatre); Some Girl(s) (Park Theatre); The Pillowman (Aberdeen Arts Centre); Alice in Wonderland (Guildford Shakespeare Company); Hatched ‘N’ Dispatched (Park Theatre). Credits for drama schools include: Sweet Charity (Royal Northern College of Music); Priscilla, Queen of the Desert (Arts Educational Schools); Crazy For You, Fanatical (Mountview); Spring Awakening, Goodnight Mr Tom (British Theatre Academy); Dear World, Carrie, Thoroughly Modern Millie, Catch Me If You Can, Honk!, Spelling Bee, Snoopy!! !, Hands on a Hardbody, On The Town, Henry IV, V & VI, LIFT: The Musical, Songs for A New World, The World Goes Round, The Gut Girls (GSA); Little Women, The Witches of Eastwick, The Fix (Performance Preparation Academy). PJ also designs Paper Props & Graphics for shows including: Charlie & The Chocolate Factory (Drury Lane); Ink (Almeida Theatre); Bat Out Of Hell (London Coliseum); Sweet Bird of Youth, Caroline or Change, Young Chekhov, Barnum (Chichester Festival Theatre); Groundhog Day (Old Vic Theatre); The Comedy About A Bank Robbery (Criterion Theatre); Motown (Shaftesbury Theatre); The Girls (Grand Theatre Leeds); 2015 Rugby World Cup (Various); Hamlet (The Barbican); Bend It Like Beckham (Phoenix Theatre); American Buffalo (Wyndham’s Theatre); Memphis (Shaftesbury Theatre); The Nether (Royal Court Theatre) ;Clarence Darrow (Old Vic Theatre); The Commitments (Palace Theatre); Richard III (Apollo Theatre London); The Phantom of the Opera (UK Tour).